Historically speaking. the single-head tom was introduced by removing the back-side head of a regular tom tom. Single-headed toms were very popular and became almost standard equipment in 1970’s. Although it provided clear attack and wide melodic sound range. single-headed toms had some shortcomings, such as an unwanted ripping sound and very short sustain. In practice. muffling and effect processing were used to cover up those shortcomings. CANOPUS researched its development of the single-head tom extensively. We put reinforcement on both ghe upper and lower sides of shell. Wealso used thicker reinforcement on the bottom of the shell to balance the sound. Further, we considered air flow when we designed the shape of the reinforcement. As a result, we successfully revitalized the rich sustain without having that unwanted ripping sound. We recommend this shell for those drummers who are interested in single-head tone, but hesitated to try one due to previously mentioned shortcomings. Consideration of the shell for a single head drum. n general, to gain stabilized results a drum must resonate as a whole. When a double-headed tom is struck, the energy given to the top head is saved in the shell allowing sustain to resonate with the bottom head. This produces controlled decay. Also, the top head vibrates, moving the air in a balanced movement with the bottom head. 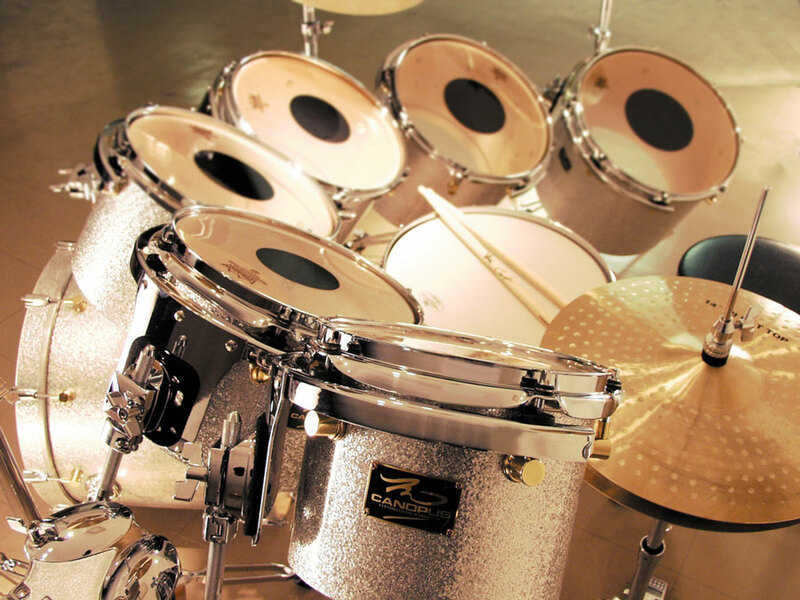 The development of Canopus’ single-head tom began by using a shell without reinforcement. Of course, the immediate result was no different than taking an existing tom tom and removing one head. The first tests focused on the edge design in order to find the most melodic tones possible. Once this was achieved, modifications of the shell were made to deliver a well-rounded and fat sound. Good results were gained by adding a thin reinforcement to the shell, but the perfect sound still eluded the developers. Even reinforced, the shell made unbalanced vibrations and did not cure all of the problems. A reinforcement of extra thickness was introduced to compensate for the mass of the head and lugs, and the results were again improved. The sound energy generated from the head collected in the shell to circulate as vibration energy. The extra mass of the reinforcement produced a reasonable resistance in the airflow of the tom. While the thick reinforcement controlled the unwanted crevice noise, the structural shortcomings created poor sound projection and short sustain. To deal with the unbalanced structure of the single-headed tom, Canopus intentionally created an unbalanced shell specification. The result is clear attack, exceptional dynamic range, broad frequency response, and proper sustain without any crevice noise.